Given an open platform and a complement of simple tools, it turns out ordinary people can create effective new information services that are speedier and more resilient than traditional bureaucratic channels ... What is remarkable is that the Ushahidi-Haiti project might have taken a government agency with loads of money a year or more to execute. Yet, thanks to social innovators like Okolloh and Meier, the crisis-mapping community rallied to pull it together in a matter of days with absolutely no cost to the taxpayer (7). The Internet, digital media, and social technologies can be powerful tools. The parallel that is often drawn is to the Gutenberg press, which changed the way information was shared and consumed forever. Though not everyone accepted the changes, those who did were able to rise with a new merchant class and the emergence of new industry practices. It's a huge lesson to take away as we stand on the cusp of an entirely new change tied to new media and technologies. Using this model of open access, sharing, and collaboration, Tapscott and Williams walk the reader through every major social institution, demonstrating that if people are invited to consider local issues—their local issues—they can produce effective, sustainable solutions. For example, in an attempt to make the energy crisis more real to consumers, Electric Shadows launched an alternate reality game (ARG) asking a simple question: What if an oil crisis began on April 30, 2007? The game ran for 30 days and asked people how their lives and communities would change without oil. Players were invited to upload photos, videos, blog posts, even voice mails sharing their thoughts, which were woven into a thought provoking narrative, with the gravity of the situation made real not by the voices of politicians, but by the those enmeshed in the situation first hand. Today every university student has at his or her fingertips the most powerful tool ever for discovery, constructing knowledge, and learning. Like Gutenberg's invention, it democratizes learning. Rather than threatening the old order, universities could embrace this and take discovery learning to the next step (145). With the New York Times reporting that students have a preference for "old-fashioned" text books, this chapter suggests that there is students are missing not only information, but also the skills on how to search for an vet information in the digital age. Universities, the authors argue, need to reorient themselves to the learning done by students, and not that of the faculty. This requires a new business model—because universities are first and foremost businesses—but also a new mindset: Expand your reach online with classes and study groups, encourage students to work together online, interact with students via the tools that will play a larger role in their lives beyond the classroom and minimize lectures, and let students play a part in rating professors in a way that is meaningful to other students. The university must adapt or it will perish. And that would be a shame. 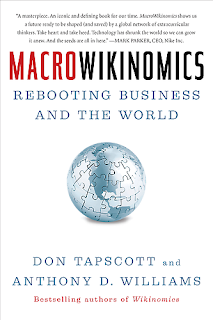 The thing about Tapscott and William's Macrowikinomics is not just that these ideas are possible, but that they're already being put into practice. That is, we know that this can work—and it could be hugely successful if we, as a public of prosumers, seize the chances to be innovators and thinkers and participants in our society. 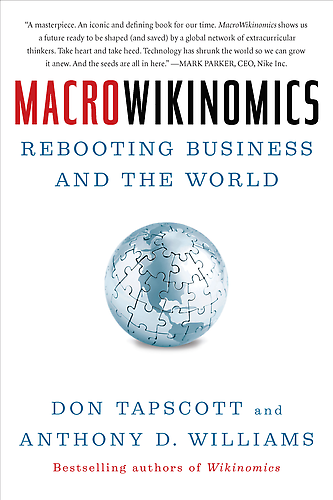 The globalized world is about to get a whole lot closer as people around the world harness macrowikinomics.